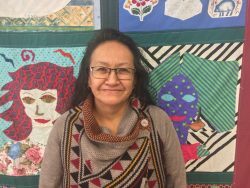 Jackie is a Cree, Sioux, Saulteaux woman who has been a strong part of our Women’s Centre community for many years. Join Jackie for a night of community and making your own medicine pouches out of leather. She will teach you about the meaning of the medicine pouch and how it’s used to carry personal treasures from nature, medicine, and spirituality. All workshops are free and supplies are provided, and are open to women-identifying individuals. No children in this workshop please. Free child minding is available for this workshop. Please contact us to save your child’s spot.